I recently had a need to figure out what sort of schoolyard games children in a very rural small town in 1896 might have indulged in. And I thought I'd share some of my findings with you. One of the things that surprised me while I was researching the topic of recess is that in some schools there were not restrictions as far as where the children could wander off to, they could mosey into adjoining rural areas or farmlands, so long as they could hear the bell when it rang and return to class on time. As for the games they would have played, it seems that most of them would be familiar to today's children - at least those who do actively play games still. Games like Tag, Hide-and-seek, Hopscotch, London Bridge, Duck-duck-goose and Follow the leader. Marbles and jacks were popular for those who had access to the materials required. And if they had access to a ball and bat - or were crafty enough to be able to fashion one - they might have played baseball. During inclement weather, when they were forced to stay inside during recess, they might have indulged in a game of I Spy or Blindman's Bluff. Or perhaps Charades or Jackstraws (what we call pick up sticks). Then there were word games which tested participants' memories, like I Packed My Suitcase, where participants list things they packed in their suitcase in consecutive letters of the alphabet. The first person might say "I packed my suitcase and in it I place an apple." The next person would have to remember what the first person said and add something that starts with a B such as "I packed my suitcase and in it I packed and apple and a balloon." And so on until someone forgets an item or adds something out of order. I used to play this one with my own kids in the car on long trips and they really enjoyed it. One game I had not heard of before was one called Throwing The Smile. In it, the players form a circle with on person in the middle. It is the job of that person to try to make everyone smile, by whatever means possible. Anyone who smiles is out. The last person standing wins. So, as it turns out, I was able to draw on a lot of my own memories of recess as a little girl to write my schoolyard scene. What about you? Was there a favorite game you remember playing during recess? 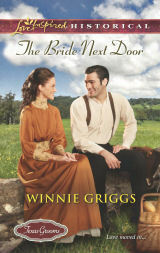 And since it is still June, I'm going to give one of the commenters on today's post a copy of my June release The Bride Next Door. After years of wandering, Daisy Johnson hopes to settle in Turnabout, Texas, open a restaurant, perhaps find a husband. Of course, she'd envisioned a man who actually likes her. Not someone who offers a marriage of convenience to avoid scandal. I've been wanting your book Bride Next Door since the last scavenger hunt so I'm wicked excited and grateful to get the chance to win a copy! Great post today!! LOL - I can soooo relate to not being athletic - I was one of those almost-lastto-be-picked kids. And one I hit high school I joined the library club so I can relate to that aspect as well. Thanks for the kind words about my book and you are definitely entered in the drawing! here it was similar we use to play things like Red rover come over, Please mr crocodile may I cross the river. Also hopsotch etc. We use to play jump rope and elastics. we also had a playground we use to play on a lot. Hi Jenny! Please Mr. Crocodile is a new one to me - how was it played? you have someone as it or the crocodile and the rest will say the words. Please mr crocodile may i cross the river if not why not mummy said I could and daddy said I couldn't then the crocodile will say Only if you have the colour and name one like red, if you have red on you can cross. all others have to try and run across without being caught. If you are caught you join the crocodile and try help catch the other people. they keep going till all are caught and the first caught is the new crocodile. Bethany - I remember that one! My siblings and I played it when we were kids. And how fun that you can play it with your own child - I'm sure those are memories he'll remember his whole life. We played games like Red Rover, London Bridge is Falling Down, "Duck, Duck, Goose", "Mother May I", chase, tag, hide and seek, etc. I went to an extremely small non-funded private school out in the rurals of central MS. There was a wooded area behind the school and an abandoned cotton gin (I think that's what it was) on the other side of the woods. There was a grocery store across the street and that was the only buildings around. Pam, oh my - what fun memories. And you can't just drop a teaser like that stampede comment and NOT explain!!! Hi Linda, and yes, that's one of the things that surprised me as well, how these same games have remained popular all these years. And thanks for the nice word about my book! Winnie, thanks for the chance to reminisce about school recess. When I was in grade school in the 1950's, we played pretty traditional games. Two of my favorites were jacks and jumping rope. Sometimes, we played "house", which just meant that we pretended like we were family members--mother, father, children--and we pretended to do the normal activities of a family. Kick-The-Can, Red Rover, Mother-May-I? Toss ball over church steeple/roof and quietly come around to the other side and the people you tagged were out ~ one neighbor had "croquette" set up but instead of pegs in the ground you had to hit a hole-in-one in the small hole in the ground using a golf ball and a board used as the mallet. That was fun and there was a bare spot toward the holes so you always knew where they were. "Thimble-Thimble who has the thimble ~ passed in a circle; or hid it in plain view ~ you're hot, you're cold." "I spy something red (color). Give clues ~ bigger than a breadbox?" Telephone ~ whisper in someone's ear and it would get all messed up because someone in the middle of the circle would say "sppaee spees spee" and you would make a face and say, "What??" and then others would say, "Hurry," and you'd have to make something up for the next person. A lot of other yard games ~ gunnysack races. I Packed My Suitcase sounds like a fun game! Also, car travel games, we would do the alphabet with license plates, and count the cows/horses at the side of the road pastures, write down states from license plates. Once we stopped at a wayside and there was a man driving back to Alaska. We asked him to sign our book of states. He was in such a hurry to get back on the road for his deadline, but he did sign it! Oh Kathleen, your post brought back such fun memories! I think I've played all of those as a kid and most of them with my own children as an adult! We mostly played kickball and jumped rope. I grew up in MI, so I am sure there were days during the winter that we couldn't go outside, but I don't really remember them. Hi Patty - those are both pretty popular games among kids. I grew up in South Louisiana so there weren't too many days, even in winter, when we couldn't go outside and play, so only the rain held us back. I remember playing Tag, Hide and Seek, Follow the Leader and Red Rover. We had a jump rope and a hula hoop. I spent many hours playing those games with my friends. Thank you for entering me in your giveaway. Barbara - ahhh the hula hoop - I never could get the hang of that thing. I imagine my efforts were pretty comical to anyone watching! Thanks for stopping by. I remember many of the games you mentioned. Jump rope certainly featured high in the summer months! Thanks for the giveaway. Hi Betti - Jump rope was one of my favorites as far as the very active games. I even tried my hand a double dutch sometimes but never was coordinated enough to keep it up for very long. Love the games listed. We played Red Rover when I was in school. Crazy how kids these days have to have hands on games to play and back then it was all in your mind or actively doing something. What great imaginations they must have had! Susan - you're right - imagination is such a marvelous tool and one whose use should be encouraged - especially in our youth. Hi Winnie, That suitcase game sounds like fun! It might be a good memory test to sharpen our aging minds. Think I'll get my husband to play it. It'll come in handy since we're going on a trip next week. We played JUMP ROPE games with double ropes, single ropes. We also played JACKS and MARBLES. All this done in boarding school in Nigeria at Kent Academy for missionary kids. I'd love to win your book! Thank-you.